Andrea will deliver two youth drama workshops as part of the Courthouse Arts ‘Travelling Through’ Youth Art Weekend on Sat April 27th 2019. She delivered a six week drama programme to the WOW (Women of the World) group in Arklow, Co Wicklow autumn 2017. The MAMS playground West, an initiative inspired by the MAM (Mother Artist Makers) Ireland movement invited Andrea to Galway to facilitate a two hour workshop with mothers and their children in august 2017. Hugely inspiring morning for mams and kids! Andrea recently facilitated a physical movement workshop with Tinahelys’ Women’s Network in June. She delivered drama workshops to the students of the Gaelscoil in Arklow, Co Wicklow in 2017. 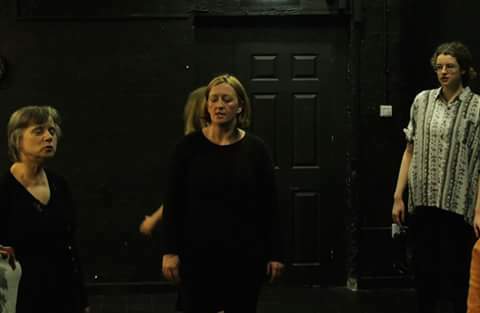 She recently delivered a four week 2 hour physical workshop with Firedoor Theatre in Dublin. ” Andrea facilitated a number of movement based workshops for Firedoor Theatre. We thoroughly enjoyed these workshops, and found Andrea to be very professional, friendly and knowledgeable. We will definitely be bringing her back in future, and would highly recommend her to other groups” – Firedoor Theatre. Andrea has worked as a drama facilitator with the Arklow, Wexford Kilkenny National Learning Network. Andrea facilitated a devised project ‘Hourglass‘ with transition year students from Carnew secondary school as part of the Pure Project and in association with the Courthouse Arts Centre Youth Theatre. School performances ran on Thurs 5th Fri 6th May 2016 and a performance open to public on Sat 7th May @8pm.